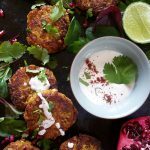 Try these simple Cauliflower Fritters with Mint and Yogurt Sauce they are so simple to make and really tasty for everyone to enjoy. Cauliflower is one of the most versatile vegetables for cooking and preparing if you have a little imagination. Bring a large saucepan of water to the boil. Add cauliflower, bring to the boil and cook for 6 minutes, add peas and cook for a further 3 minutes. Drain vegetables and transfer to a large bowl. Using a potato masher, gently mash cauliflower and peas. Sift together flour and spices. Add the cauliflower with egg. Mix to a stiff batter. Heat oil in a frying pan over medium heat. Cook 2 heaped tablespoons of the mixture for 3-4minutes each side or until golden brown and cooked through. Transfer to plate lined with paper towel. Combine yoghurt, garlic, mint and lemon juice in a bowl.